This beautiful yet handsome Buddha charmed stretch bracelet is assembled with Red Goldstone and Lava Rock. For a boost in boost your drive, motivation, and confidence, Red Goldstone will tackle that task. Paving the way to your dreams, it's called an "Ambition Stone" for certain reasons. Restoring harmony to your mind, body, and spirit, it will encourage a positive attitude. Red Goldstone will ignite your inner light and allow you to create organization, allowing you to realign your daily chaos. Cleansing your aura of negative energy will be the benefit of the Lava Rock. It aids with anger management, and increases your sexual drive. Let's not forget that it is also a mood stabilizer, raises your energy levels, and creates motivation. Lava Rock is a very sought after stone, due to it's raw beauty and the ability to use as a diffuser with essential oils. 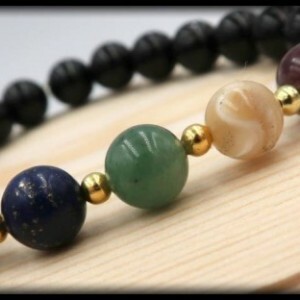 Simply add a drop of your favorite essential oil in one or more of the beads on the bracelet. 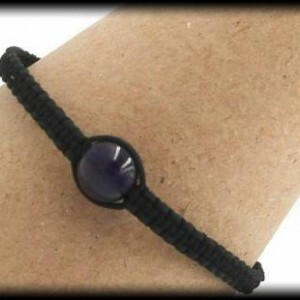 This striking bracelet is made with 8mm beads of Goldstone and Lava Rock. SIZING INFORMATION Please measure your wrist with a measuring tape to ensure the most accurate measurement. If you do not have a measuring tape, you can also use a string by wrapping it around your wrist and then cutting the piece of string. After you have your cut string, place it alongside a ruler and write down your measurement. To ensure a perfect fit, please had 0.5 inch to your wrist measurement, if you want a little room please add .75 inches to your wrist measurement..